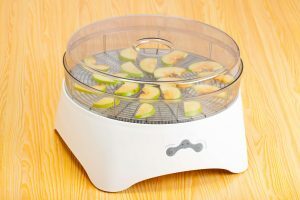 If you are considering getting a food dehydrator, we think you are very wise. They are a must-have in any kitchen for convenience, for making healthy snacks and for keeping food for future use. It’s not just about banana chips and beef jerky, although you should totally make those, too. Food dehydrators are equipped to dry anything you want, and it isn’t a new fad. People have been drying their food for thousands of years, to preserve it and store it safely. Meats, fruits and vegetables and grains were hung or set out and they let the sun and wind do the work. Although our methods of drying food have advanced, the reasons have not. Life with a food dehydrator is just better. The moisture in foods is what makes it turn bad because that’s how bacteria and mold can grow. 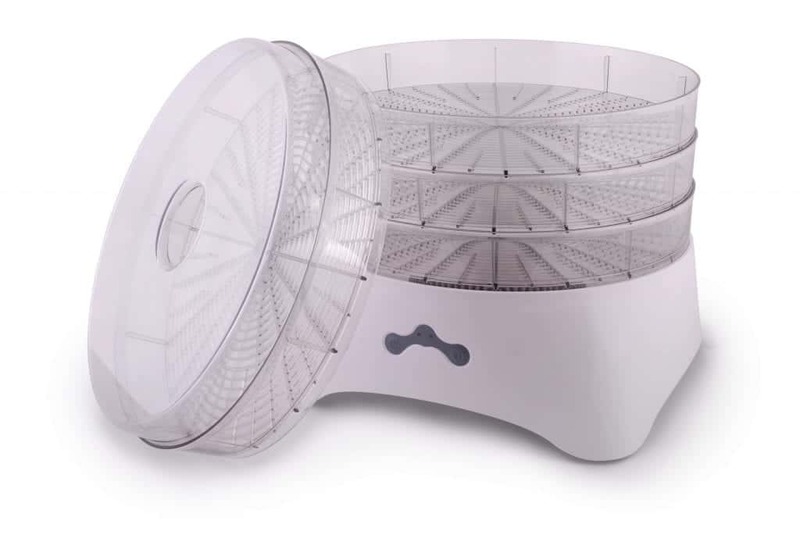 The food dehydrator uses low heat and air to remove the moisture or water from your foods. It preserves the flavor and all the nutrients and also prevents the rotting process from happening. Food is slowly heated and then fans are used to ventilate the dehydrator and take the moisture out. Drying the foods you love keeps them from going bad and allows you to store them for, in some cases, years. It’s the perfect solution to keep food for a long time, and also having great food on hand. It reduces waste and the amount of food you throw away. You can dehydrate foods that are getting too ripe or starting to turn bad. 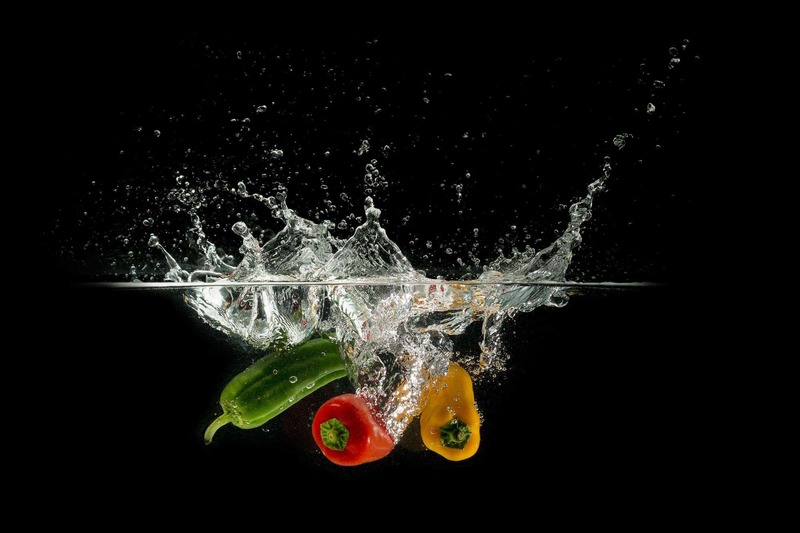 The dehydration process removes all of the moisture and preserves the food. The dehydrated food tastes great. Taking out the moisture leaves all the flavor and nutrients in for a full, rich taste. It takes less room to store the foods, as they don’t need refrigeration or much space in the cupboard. They are very convenient, for lunches, for traveling, for camping and hiking, a great and healthy snack on the go and kids love them. The best part of using a food dehydrator is that you can put almost anything in it. 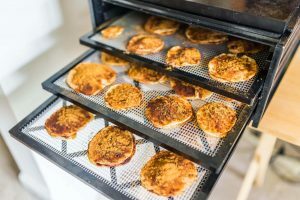 Use all your favorite foods and depending on the type of food dehydrator you have, you can usually do several types at once. 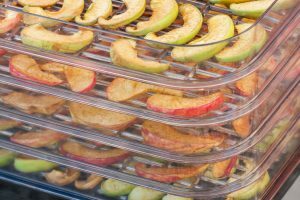 Dehydrating fruits and vegetables, the option to make your own spices, condiments and healthy snacks for your family and your pets, you are only limited by your lack of imagination. 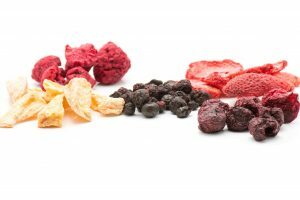 Most kids seem to love dried fruit or the fruit strips. You can easily make your own and know that they don’t contain anything unhealthy. It’s really nice to ab able to enjoy your favorite fruits out of season, as well. 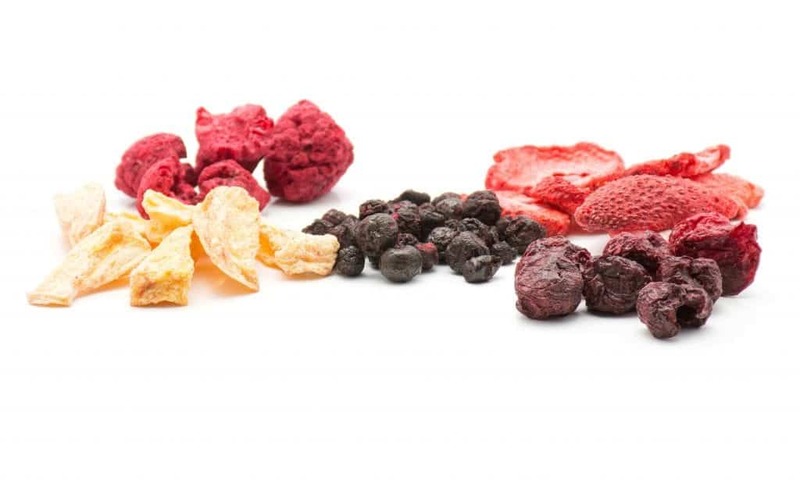 Dried fruits, like bananas, strawberries, peaches, and apples make fabulous and healthy snacks. You can eat them as they are or add them to smoothies, cereals and trail mix. Grapes for your own raisins, coconut, cranberries, pineapple, and watermelon all come out beautifully and are perfect on their own or mixed together. If you have ever bought sundried tomatoes, you how expensive they can be. Making your own cuts cost and allows you to have plenty on hand. 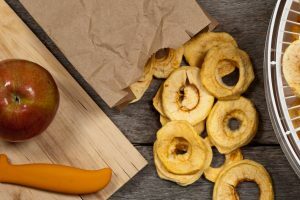 Making your own vegetable chips is a fun and healthy alternative to potato chips, but you can make those, too. Almost all vegetables can be put in the food dehydrator for use later, in snacks and for use in your favorite dishes. If you have a garden, you can dehydrate all your peppers, onions and beans to keep on hand for stews or chili. If you have ever read the side of a spice bottle, you likely found a lot of words you couldn’t even pronounce. You can easily make your own garlic salt, Italian seasoning, chili pepper, or a combination of many. Any types of herbs or vegetables can be dehydrated and used for spices or mixed in to use for dips, BBQ seasoning or garnishes. Onion powder, ginger and any other you have access to, like cumin or turmeric roots. You can buy the produce or even grow them yourself, all you need is a sunny window box to grow many types of herbs. You can do it with flowers and other herbs to use for aromatherapy, soap, bath oils, and your own potpourri. If you have a flower garden, it is a great way to get the most out of your blooms. 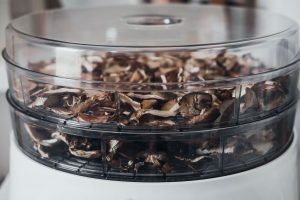 Drying your own seeds and nuts are another big bonus and cost-saving idea for your food dehydrator. Pumpkin seeds, sunflower seeds, and raw nuts turn out great and you know there are no added salts or preservatives. You can also make green flour, your own oatmeal, tea, rice, bread crumbs, and soup cubes. 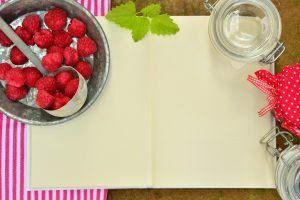 You can make your own yogurt, granola for snacks, cooking and health bars, or to mix with your other fruits. You can also make great pet treats, using certain vegetables or packages or scraps of meat ends for purchase, or from your own kitchen. You will be able to control what goes into the treats and not be worried about additives for your pet. 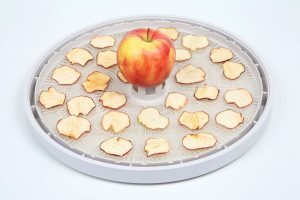 The uses and benefits of using a food dehydrator are endless. From soup to nuts, and all kinds of life hacks to make your life easier and more streamlined. If we can make healthy, nutritious, delicious and portable snacks and foods, it just makes sense that we try. Saving money, reducing waste, simple, easy and inexpensive. 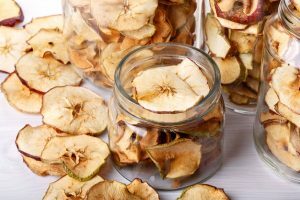 The ability to dehydrate many foods at once is also a time-saver. Easy to do, easy to store and so many options for uses of your dehydrated foods. Food dehydrators don’t require a lot of maintenance and will serve you and your family for years. The money you save on wasted food alone will pay for your appliance. Get chopping, get drying and start saving and enjoying your new dehydrated foods and snacks for years to come. 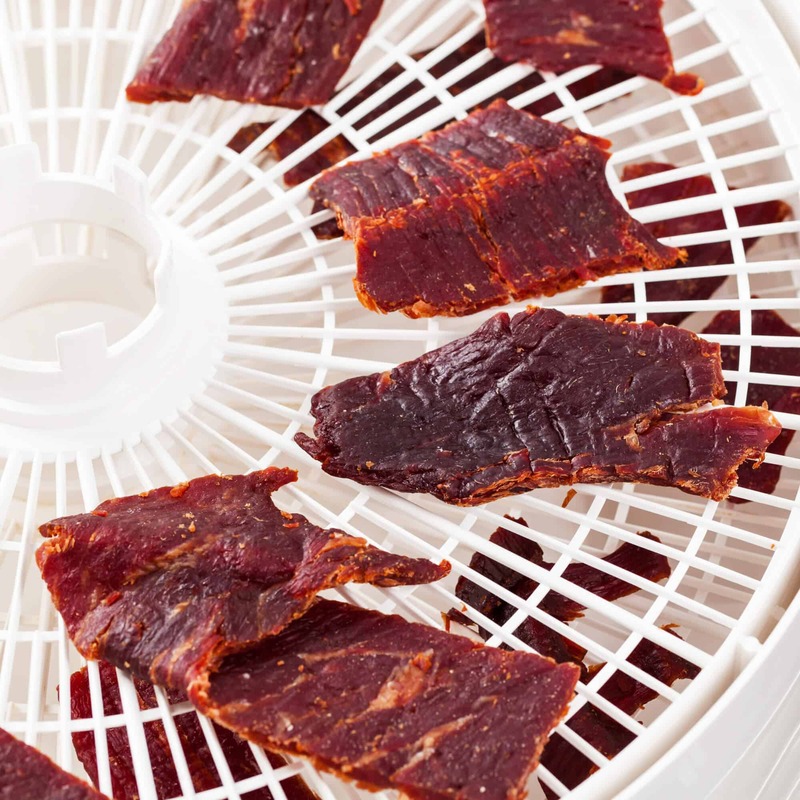 There are plenty of tips for finding the perfect dehydrator for you.